When my DVD copy of the documentary Kibbutz arrived in the mail late last year, I was so busy that I didn’t have time to put it into a player for a couple of weeks. When I did, I was disappointed that it had gotten damaged during its journey from Israel to the West Coast of B.C. The film’s producer quickly mailed a new copy. This time, I immediately popped it into my computer at work to make sure it functioned, so I’d be ready to view it when I had more free time. An hour later, I had watched the film in its entirety—and become so engrossed in the account of the slow, sad unravelling of Kibbutz Hulata that I nearly forgot to pick up my daughter at daycare! Hello, I just stumbled across this post – not sure if you're still maintaining the blog. I was wondering how you were able to acquire your copy of the movie. I spent four months volunteering at Hulata in the mid-90's and am desperate to get my hands on this film. I emailed the filmmaker years ago but never got a response. Would love to learn how you went about getting the dvd. Thanks! Hi Masha: Sorry to be slow to get back to you! I've been buried in work & neglecting my blog to focus on finishing a book about the whole kibbutz movement. Which email did you try to contact the filmmakers at ? I went through Gal Schwartz via galschwartz@gmail.com . You could try that. I tried to meet the filmmaker dring my last visit to Israel but my plans fell through. Thanks, Niall. Yes, it's a powerful and moving film — probably the most emotionally hard hitting of the different kibbutz films I've watched. Interesting review David. My wife and I worked on the Hulata Kibbutz for 3 months in 74 and both loved it. I was very disappointed that such a strong community spirit died. I will see if I can get a copy of the DVD all the same. I had considered going back and having a look, but I won't now. It would be very depressing. I would like to meet Racheli Schwartz on my next as yet unplanned (but soon), visit to Israel as well. I have been wanting to watch her video 'Kibbutz' for several years. It always seems very difficult to obtain information on the internet about this film. I also (as Niall in an earlier comment) volunteered on Hulata in 1977-78 and again in 1980 (and have known and kept contact with Niall since that time too). 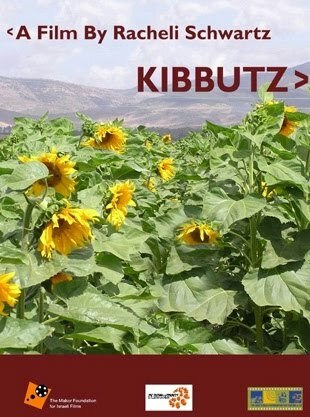 I am sure a significant number of several thousands of ex-Hulata volunteers would like to watch 'Kibbutz' too. I am fortunate to have business links in Israel nowadays, but yet to return. A revisit back to modern-day Hulata is at the top of my list, which I hope will be possible to achieve. Aspects of kibbutz life on Hulata throughout its volunteer years are a significant part of its 80 year history and continue to be a significant part of many of our (ex-volunteers) lives whever we are living in the world today. I was an American volunteer there in 1971. My parents sent me there to get away from NY and the drug culture. A lot in this review is very nostalgic and familiar. I worked in the orchards picking fruit. I thankfully transitioned to working in the shoe factory which was air conditioned. I remember the big dining hall. I also remember the winding trenches meant to provide shelter from Syrian snipers up on Golan Heights. I met a number of Holocaust survivors who were quite numerous. My favorite part was the fact that there were kids from the UK, France, Germany and all over the US. I even ended up with a girl friend who lived in Cleveland. While I complained like hell when I was there, I have very fond memories of Hulata and I am sorry it imploded. Hi Ian: If you email at dleach@uvic.ca, I can pass along a contact for Racheli. I have her son's email. We tried to connect with her during my last visit to Israel but we couldn't coordinate our schedules. Her film is excellent — and I imagine even more poignant for anyone who has lived on Hulata. Thanks for your message. Yes, other kibbutzes (like Shamir, where I volunteered) managed to make the transition into "privatization" without the trauma that occurred on Hulata. Meeting the volunteers from around the world was also a big part of the appeal of the kibbutz for me — and an important part of my education about the world.